I wanted to create something special for mothers' day to send to my sweet mom and my wonderful mother-in-law. I knew they would both appreciate the herb motif since they are likely to be growing one or more of the above as we speak. I drew the herbs, scanned and printed them on 100% cotton scored cards and hand-painted them with watercolor. I sent our moms a set of six (two of each card) with matching envelopes. 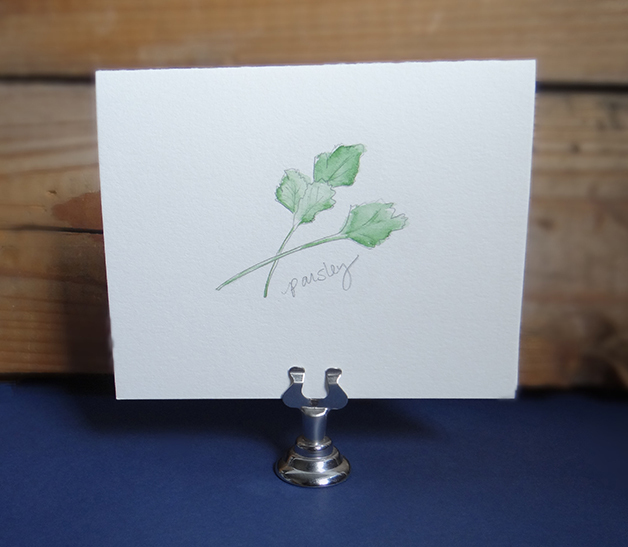 If you're also a reader of Kaylan's lifestyle blog, you may have seen that I recently began offering short-run printing services (Kaylan was my first official client with her gorgeous original watercolor notecards). My new printer is capable of the highest quality printing and especially suited for fine art papers and heavy cardstock--making it perfect for printing stationery, wedding invitations, announcements, etc. Nightingale Handmade is now an official business registered in the state of California in San Diego county. I pay taxes and everything, woo hoo! It's a fun new endeavor that's still at the very beginning stages, but I'm excited to see where it takes me. If you are a designer or artist looking for a custom digital printing job, I would love for you to contact me to discuss the project. I know as a designer how difficult it can be to find top quality flat printing on the paper you want with the care you yourself would give it! You can contact me at nightingalehandmade@gmail.com. Oh, and if you'd like to purchase a set of the cards above, I'm hoping to make that possible soon with an online shop. Changes changes coming to the NH blog!